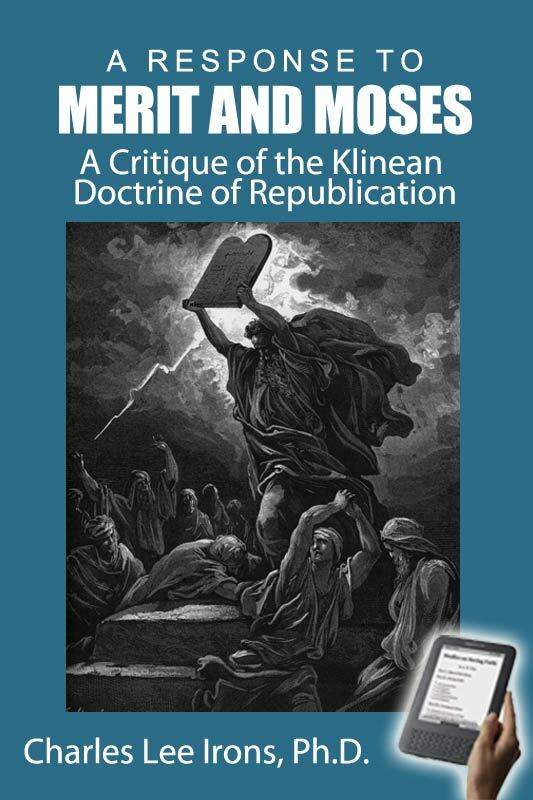 This document combines a series of posts originally published on Dr. Iron's blog in response to the book Merit and Moses: A Critique of the Klinean Doctrine of Republication, by Andrew M. Elam, Robert C. Van Kooten, and Randall A. Bergquist. Merit and Moses began life in April 2013 as a “Booklet on Merit in the Doctrine of Republication” presented to the Presbytery of the Northwest of the Orthodox Presbyterian Church (OPC) as part of its deliberations on the overture to the OPC General Assembly to study the issue of republication. I read it when it was a booklet in 2013. Merit and Moses is a more polished book form of that booklet. I’ve carefully read the book twice. If you count the original booklet version, I’ve read it three times. I have a number of reactions and responses that I want to write up. Let me begin by saying that I know all three authors personally, although I have not been in contact with them since leaving the OPC. Two of the authors were students at Westminster Seminary California (WSC) at the same time that I was a student there. We sat together in the same classrooms. We worshiped together in chapel. In the case of one of the authors, we were pastoral interns in the same church. We studied the Scriptures together under Kline who was one of our influential professors. There was a time (though it seems so long ago now) when we were friends. Now they have decided to launch an all-out attack Kline. They now argue in this book that Kline’s particular formulation of covenant theology is an intolerable deviation from the OPC’s confessional standards. Because of our past friendship, I have been reluctant to respond to the attacks on Kline coming from those associated with the Northwest Theological Seminary. I do not relish theological controversy. Disputes such as this are painful. But I believe it is time for me to speak out, for several reasons. First, I must respond simply because the charges they level are so serious and so misleading. They say Kline’s covenant theology “will lead to catastrophic alterations within the system of doctrine” and “will inevitably damage the structure” of the Westminster Confession’s covenant theology (MM 65). It “disrupts the system of doctrine contained in our Westminster Standards” (MM 134). They charge that Kline’s republication doctrine, in violation of baseline Augustinian and Reformed theology, teaches that “a group of fallen sinners can merit or extract a blessing from God” (MM 39). And, even worse, Kline’s republication doctrine “serves to undermine the singular glory of Christ’s meritorious obedience” (MM 116). These charges cannot be allowed to stand unchallenged. Second, with the publication of Merit and Moses and the formation of the OPC Republication Study Committee, it seems their charges are beginning to get some traction. They have even managed to get respected Reformed professors, such as Robert Strimple (another former professor of mine at WSC), Cornelis Venema, and Richard Gaffin, to endorse their book attacking Kline and those of us who appreciate Kline’s biblical-theological and covenantal insights. They also were able to get OPC pastor William Shishko to write the Foreword for their book, as well as an endorsement from Presbyterian Church in America (PCA) pastor Mark Jones, author of a recent book on antinomianism. Seeing so many take this book seriously is troubling. Third, I feel the need to respond since I am quoted in this book, specifically my article “Redefining Merit” in the Kline Festschrift. The title of my article is even used as the title of Part 2 of the book: “Redefining Merit: The Klinean Paradigm Shift” (MM 41). They seem to have taken my article as their starting point to find a foothold to make an argument that Kline’s republication doctrine is a “catastrophic” departure from orthodoxy. A "Pure" Covenant of Grace?